‘The Knight’s Table’ – the one, true name for the ECCI Feasting Hall? The fascinating and sometimes gruesome history of ECCI’s new building at High School Yards includes tales of Medieval Knights and Burke and Hare, a place where Mary Queen of Scots and Sir Walter Scott share the billing with tales of murder, mystery and…the invention of the blackboard. 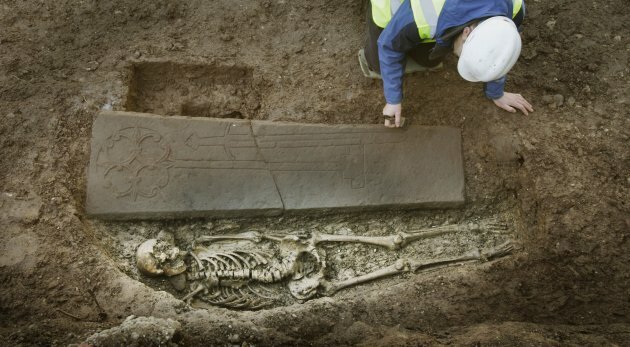 At the beginning of March the skeleton and grave of a Medieval Knight and the remains of a thirteenth century monastery are among dozens of discoveries made underneath the car park in the front of the building. The discovery was made when archaeologists uncovered the corner of an elaborately decorated sandstone slab with the telltale markings of a member of the nobility – the carvings of the Calvary Cross and an ornate sword, which tells us this belonged to a high status individual such as a knight or other nobleman. ‘Sustain’ – in keeping with ECCI’s plans for a sustainable future (and keeping us fed and watered). As well as alluding to the essential function of the Cafe in keeping all its student, staff and visitor inhabitants adequately fed and watered, ‘Sustain’ neatly encapsulates ECCI’s plans for a sustainable future. The Edinburgh Centre for Carbon Innovation has been created to solve a global problem. ECCI is a hub for the knowledge, innovation and skills required to create a low carbon economy. Located in Edinburgh, Scotland’s political centre and capital city, and building upon the best ideas from around the world, the ECCI provides the place and space for ‘low carbon leaders’ and networks from business, finance and the public sector to work together to deliver a low carbon future. ’Green Bean Café’ – Fitting for a lean, clean & green building. A combination of new technologies, innovative methods, common sense, and attention to detail has made ECCI’s new building an exemplar of social, economic and environmental sustainability. ‘Blackboard Café’ – Named after one of our v famous former pupils. The building currently being refurbished by ECCI was built by Alexander Laing in 1777 as the Old High School of Edinburgh at the cost of £4000. In the 1700s the Royal High School was regarded as the city’s best educational establishment. Pupils who studied in this building included some of the city’s leading figures of the age, such as author Sir Walter Scott, politician Robert Dundas, 2nd Viscount Melville and lawyer and conservationist Henry Cockburn.